For a dude who’s mostly known for writing for other artists, I draw a lot. Although I don’t often share these drawings, like most cartoonist weirdos I have piles of sketchbooks littering my various floors, bookcases, backs of closets, Rubbermaid bins stacked in my garage, and secret bunkers for when I fake my own de…I mean, uh, yep. Sketchbooks. Lots of them. Because, like Dory from Finding Nemo–and Finding Dory too, of course, but that just seemed repetitive to mention–I just keep drawing, just keep drawing. 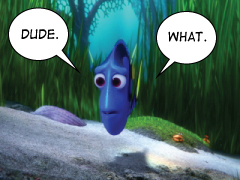 Except Dory didn’t draw, she swam, but that same basic idea, with less water, and more paper and drawings on the paper. Anyway, when I was a kid, and I’d get a new sketchbook, I’d get a little stressed by that first blank page. I felt like I needed to christen the new sketchbook with some amazing masterclass of drawing. The character design of a surefire best seller. The perfect illustration of a concept that would unfetter humanity from the bonds of hate and ignorance. A halfway decent Spider-Man. Something. These days, though, when I get a new sketchbook, I like to open up to the first page and scribble the first things that come to mind that I can fit on the page. Just to preempt thinking, and get on with drawing. Doodles have always helped me get past the road blocks of my own neuroses, whether distracting me from intimidating circumstances (like, say, adapting a great work of literature) or simply warming up to climb whatever mountain of work I’ve got piled in front of me. Doodles, even if they have nothing to do with the work, are a way in. Lynda Barry talks about something similar (I think in her book What It Is, but it might be a different one) when she says that, if you’re stuck, just start writing the alphabet. The physical act of writing and drawing gets the mind moving. Something similar, I think, is bound up in psychologists’ research findings that taking notes by hand is preferable than taking notes by typing on a computers. In a similar vein, I used doodles to take notes on Kindred. Literally. 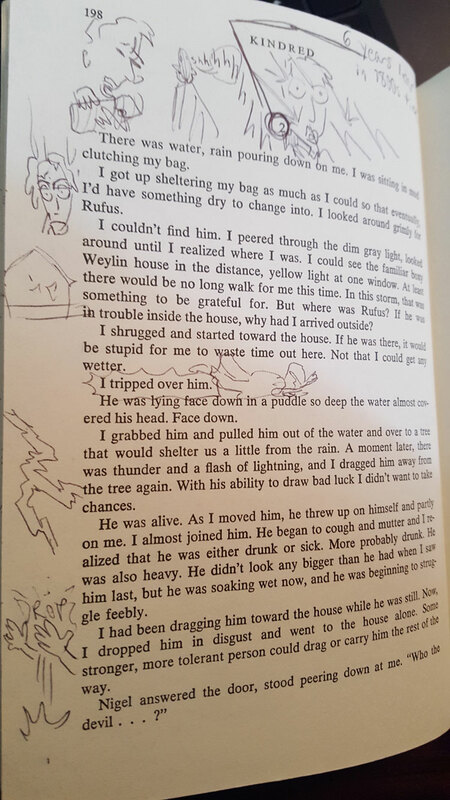 The margins of my copy of the novel are covered in doodles. I used it as a way of highlighting scenes that I felt were important, so they’d be easier to find later. I was also thinking of it as kind of a first step in moving the story from prose to comics. But mostly I used it as a way to make myself approach the novel from the vantage point of an adaptor, staying aware of the potentials for visualizing important scenes, fighting the strong narrative currents of Butler’s prose, which are constantly pulling you into the drama and action of the story. Which is what great writing is supposed to do, but getting swept up in the story means overlooking the various technical concerns required in finding which parts work best as a graphic novel. So in this instance I guess I’ve been using doodles not just to keep myself from overthinking, but to encourage myself to think about the story in a different way. Then comes the next sketchy step: Drawing out thumbnails for no one but me. 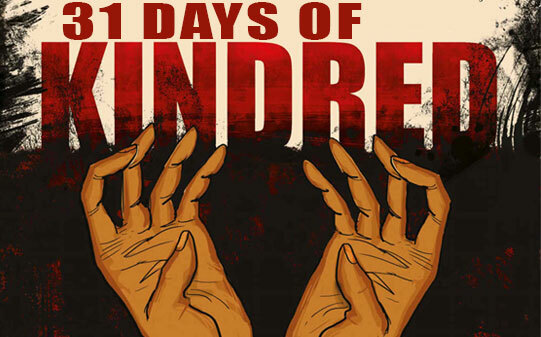 More on that in Day 6 of 31 Days of Kindred.